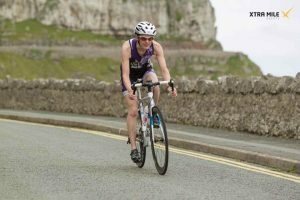 The last weekend of June saw the Mr and Mrs of the Jackpot Team, Martin and Emma Stoney competing in the Llandudno half and sprint triathlon. Here’s Emma’s race report. “I have never visited Llandudno before. One of the first things I noted was that parking is a total nightmare, which is why people only generally choose to visit once they are old enough to travel by mobility scooter. We checked into our hotel, right on the sea front and where race registration was taking place, so things couldn’t have been more straight forward. The sea looked relatively calm and inviting in the sunshine the day before race day which was good news, as I have never done a sea swim before and was feeling the nerves. We ate dinner in the hotel (along with Edna, Dorris, Frank and Norman – presumably not triathletes) and then settled down in our already cosy room with two bikes and all the paraphernalia that comes with racing. Next morning we literally crossed the road to rack our bikes. The weather had turned over night. The sea was now grey and decidedly rough looking and there was drizzle. Nice. The Middle Distance race was the first to start at 10.30am. My sprint wave was not due to begin until 12.30, which was how I justified the full cooked English breakfast I wolfed down. 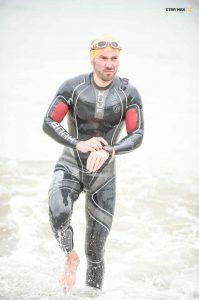 I saw Martin come back into transition after his swim and was unnerved by his report of it being ‘quite choppy in there’. He seemed happy enough though as he set off on the bike leg – one loop of the Great Orme before heading out into the Conwy hills. I set off for the pen on the beach and waited to be counted into the water with the other 50 female athletes in my wave. It is a deep water start, so having swum out from the beach, we were held treading water for around 10 minutes before the start gun finally went. They were a fairly competitive crowd with it being a Championship qualifier, so I kept out of mischief towards the back of the pack and concentrated on what mainly felt like drinking plenty of salt water and being smacked in the face by waves. I was relieved to finish the swim of 750m and to get on the bike. The Great Orme was a closed road section and the Sprint took you twice round, up what was quite a drag and then a fantastic descent which I loved.The run for the Sprint was mainly on the flat – an out and back along the promenade. The Middle Distance was more challenging and involved a run route with several hills in it. Emma Stoney in the Sprint. In between the Middle Distance and the Sprint is an Olympic distance race – so something for everyone. Charles Hickman was also racing the Middle Distance and had a great result, taking 4th Male and first in his age category. Martin really enjoyed the race and was pleased to finish the run feeling strong. He finished 18th male and 3rd in his age group (he’s not sure where all the other 40-44 year olds were racing that day) whilst I finished 6th in mine. Thanks and well done Emma, Martin and Charles.